Angus was the son of Annie E. Mooney and George McWilliam of Lot 8 Concession 14. He enlisted in 1941 and served with the Marine Section on the Queen Charlotte Islands, British Columbia. He was sent as bomb aimer to 626 Squadron in England the following year. His 15th trip was over Germany in 1944. He was shot down, bailed out over Belgium and was fortunate to land near American troops. However they were desperately fighting off a German offensive and mistook him for a German spy and almost shot him! He was later driven to Brussels for the flight home. He was discharged on October 10, 1945, and was then transferred to the Reserve, General Section, Class "E". He received two medals : the 1939 - 1945 Star and the Canadian Volunteer Service Medal and Clasp. After returning to Canada he married Constance White and they farmed. Later he worked for the Department of Veterans Affairs and then he started a real estate and insurance business in Ingersoll. Their children are Robert, Lynda, George, Mark, Harry, and Lori. His brothers, Bruce and Ross, also served in WW11. My father, Kenneth Angus McWilliam, was born in August, 1920 and raised on a farm near Thamesford, Ontario, Canada, about 15 miles east of London. As a bombardier with 626 Squadron in Wickenby, England, he flew 15 operations. His last was to Osterfeld, Germany on December 31, 1944. During the flight home his plane was attacked by a night fighter. Within seconds the Lancaster was on fire. The pilot gave the order for the crew to bail out. *FS (AG) Terrance Anthony Casey, RCAF, from Windsor, Ontario was the only member of the crew who did not respond. F/O (AG) William Henry Pogson RCAF from Orangeville, Ontario and Sgt. K H Austin RAF were also killed: Their burned bodies, still harnessed to fully deployed parachutes, were later found. 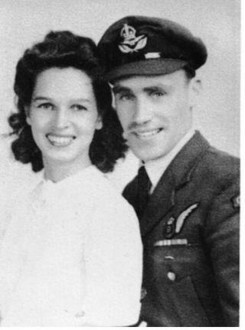 F/O F J Benoit RCAF, F/O A L Warren, RAF, Sgt. H Harrison RAF, F/O Beattie and my father survived. It was the late evening of December 31, 1944. The sortie to Osterfeld, Germany was low level and against railroad yards. The intent was to deny the Germans reinforcements and supplies for their Panzer divisions. PB 687 was thus low and vulnerable. It was normal for the Lancasters to go low after the attack to gain speed to get out of the hot zone. My father, Angus McWilliam, remembered going up and over houses, probably to be out of the way of radar. He first became aware of the attack when he observed tracer fire passing through the right wing. He signaled the pilot and leapt to the nose guns to fire on the fighter if it came back nose on. The enemy did not come back and he never saw the fighter. The pilot ordered him to abandon the plane as it was now burning. He raced to the rear of the plane, the intercom wires and flight helmet ripped from his head. As the parachutes were at the rear and not the front, he had to climb over the spar to the rear of the plane, grab his chute and then back to his position in the nose over the escape hatch. As he told the story he said how difficult it was getting to the front of the plane because of the steep angle of ascent. This maneuver was necessary to gain altitude so it would be safe to bail out. The right side of the plane was already cherry red from the heat. It took great force to push himself out. He pulled the ripcord immediately rather than wait for the 10 second count. Fortunately, the parachute did not catch on anything. He believes he passed out but quickly came to with the sensation of going up. The jolt of hitting the ground destroyed this illusion. The landing was hard mainly because the plane was so low. The pilot was blown from the airplane before he had a chance to escape, but he survived. His landing was near Pepinster, Belgium, in the midst of a major battle zone - No Man's Land as he expressed it. Shortly after landing he made contact with the 49th A-A-A brigade, an American unit. The enemy in some instances were wearing allied uniforms and the Americans wanted to make sure he was who he said he was. They believed that German SS soldiers were being dropped into the zone, disguised as Canadians. Their situation was such that they were not taking the chance he could be a German. He was questioned, identified as Canadian by General Timberlake and driven to Brussels for the flight home. General Timberlake gave my dad his scarf (which our family has to this day) to help him fend off the cold. The situation of the 49th was indeed desperate. They were to protect the retreating American flanks against the German advance. My father told me these details during a tour of a Lancaster bomber in Calgary, Alberta. Though he was ill at the time, his energy levels rose. He noted where he threw his parachute as he entered the plane, the difficult route the rear gunner had to take to escape, the seemingly long tunnel in the upper fuselage to the front of the plane, even longer with the cherry red glow on the right fuselage. My father showed me the hole he climbed down through to get to his position at a bomb aimers window in the lower nose and where the guns were mounted where he could stand and fire them. This was below the co-pilots seat. In this position the escape hatch was immediately below him and behind him was the bomb bay. As he lay down in the bomb aimer’s position he noted that for this plane the release switches were still in place and the plane was still rigged with WWII trigger mechanisms. Sighting the bomb aimer, guiding the plane in on target were his responsibility. Dad rarely discussed his wartime service, perhaps thinking that it was such a long time ago nobody would be interested in hearing about it. And I had rarely asked him. I was 10 years old. It was the Fall of 1972 when mom and dad took our family to Windsor to visit relatives. Dad asked me if I would like to see the kind of airplane he flew in during WW 2; it was on static display at Queen Elizabeth Park, not far from my uncle's place. I eagerly jumped at the chance to see it. As dad and I walked around the plane he explained to me the principles of aerodynamics that gave a plane lift and then pointed to the escape hatch, just like the one he pushed himself through. Then his eyes paused at the list of names at the base of the memorial. Puzzled, I asked him if he knew any of them. It was not until 30 years later, while I was visiting England, doing research on dad's wartime service when I discovered that a fellow crewman, FS Terrance Anthony Casey, was named on the memorial. I cannot imagine the personal meaning that memorial visit had for my dad. A family friend told me that he always saw my dad wear his familiar caterpillar pin with much humility. This tiny gold pin he wore on his suit jacket lapel was a symbol of the silk parachute that saved dad’s life. One day, while doing some yard work with dad, just a few months before he died, he told me how it took every ounce of strength to push himself from the stricken airplane. Dad passed away on May 22, 1993, survived by my mom Constance Eleanor, six children and nine grandchildren. *The three casualties are buried in the war cemetery, Hutton, Luxembourg, Belgium. FS (AG) Casey’s name is inscribed at the Royal Canadian Air Force memorials at Queen Elizabeth and Dieppe Park.